All photos by Brian Petro. Most people know it as the Mistake on the Lake. The Cuyahoga (ky-uh-HOEG-uh) River, running through the industrial heart of the city to Akron and into Geauga County, is best known for a 1969 fire that helped spark a conversation about the environment while cementing Cleveland’s reputation as a city on the decline. That river had burned at least thirteen other times, but that was the one that made it into TIME magazine. As a child, I remember notifications in the Plain Dealer, Cleveland’s newspaper of record, about restrictions on what fish you could eat out of Lake Erie because of toxin accumulation. Until recently, it had also suffered a fifty-two year major sports championship drought, broken by the Cleveland Cavaliers. I will add that the minor league Lake Erie Monsters sparked the rally by winning the Calder Cup in the AHL, but I am biased to hockey. Cleveland is seen as a Rust Belt-relic, a big city that could have been, and a major city in a fly over state. Outside the state, it has a questionable reputation. Inside the state, and especially inside the city, we know better. While the national media is just starting to sing the praises of “The Land”, the city itself has been doing what it always does: ignoring the critics and just keep improving. The Cleveland Clinic is a world leader in medicine with a sprawling campus on the east side of the city. Just past that is University Circle, home to a beautifully renovated Cleveland Museum of Art. University Circle also houses Severance Hall, home to one of the best orchestras in the country and Case Western Reserve University, ranked 37th in the country for its undergrad program by U.S. News and World Report. Looking for the largest performing arts center outside of New York City? We welcome you to Playhouse Square, complete with amazing bars and restaurants in walking distance. Many of you may know that A Christmas Story was filmed in The 216, but did you know parts of Spider-Man 3, The Avengers, Air Force One, and Captain America: Winter Soldier were also filmed there? It is also home to the largest Hungarian population outside of Hungary, and has a generally eastern European flavor. We have not even touched on the food. Michael Symon has done amazing things to put Cleveland on the culinary map. Lola laid the ground work for the empire he has built there, and it continues to grow. Jonathon Sawyer made his mark in the city as well, being recognized by the James Beard Foundation in 2015 with their Best Chef Great Lakes for his work at The Greenhouse Tavern, Noodlecat, and Trentina. There is no need to focus on fine dining. Slyman’s Restaurant will make you a sandwich as big as your head. You can pick up a host of delicious treats at the venerable West Side Market in Ohio City, or get a classic taste of Cleveland at Sokolowski’s University Inn (another Beard Award winner). The explosion of the food scene has fanned the flames of a thriving cocktail and beer scene. Yes, Cleveland bars and watering holes can stand up to any other gin joint in the country. I will listen to the fact that they may be behind on the trends, but that has never bothered the waves of thirsty people lining up to have a beer, a glass of wine, or a well-crafted cocktail after a long day at the office. They are as complex and impressive as anything you will find on the coasts. Our bartenders are leaving the state frequently to discover what other liquors and spirits are becoming popular and reporting their findings. This involves either developing their own concoction to match the flavors or appealing to the liquor control board in Ohio to make it available. This is Cleveland after all. Nothing is given, everything is earned. If you are going to be in The Land in the near future, here is a list of a bars for you to visit, from the best cocktail bars in the city to cramped dive bars with all the atmosphere you can soak in. Velvet Tango Room (2095 Columbus Rd, Cleveland, OH 44113, 216-241-8869) – The VTR is mentioned first because when you ask about Cleveland cocktails, this name will roll off anyone’s tongue. House made bitters and syrups, numbered and entertaining menus, and three to four ingredient cocktails keep patrons coming back to see what spirited magic is being conjured next. It must be some wizardry, because the bartenders here make it all look effortless. The Rouge Awakening was developed to help one of the bartenders find her love of Campari, and she nailed it by adding rhubarb and grapefruit to the mix. If you want to stay with the environment’s speakeasy history, order up a refreshing Bourbon Daisy featuring their house made ginger beer. Porco Lounge and Tiki Room (2527 W 25th St, Cleveland, OH 44113, 216-802-9222) – Just a little south of downtown you will find a little slice of tropical heaven. Porco has done its homework on tiki; their cocktails are served in an amazing variety of glasses, with fancy umbrellas and toys garnishing the drinks. Toys aside, these cocktails are serious business. They have all the kick of the classic tiki cocktails along with the juices and the spices. You can choose what level of Painkiller you are looking for, from one to three. The Heart of Darkness is well balanced between the citrus and the rum, while the Mai Tais and Zombies offer a little boozier kick. Depending on the group size, you can get most of their cocktails in a punch-sized Scorpion Bowl format for sharing. Society Lounge (2063 E 4th St, Cleveland, OH 44115, 216-781-9050) – Its proximity to Quicken Loans Arena (home of the Cavs), Progressive Field (home of the Indians), and Playhouse Square make this an incredibly popular spot. Walking down the stairs takes you from the early 21st century to the early 20th century. The low lighting and the décor set the low key mood, preparing you for a lovely night of cocktails. Their menu is as much of a work of art as the cocktails, leading you to the libation you want with simple graphics and a key. They offer a full spectrum of drinks, from rare classics like the Corpse Reviver #1 to their own complex creations like the Smokey Robinson (which is actually smoked as you order it). Great Lakes Brewing Company (2516 Market Ave, Cleveland, OH 44113, 216-771-4404) – It would be irresponsible of me to suggest any other place for a good beer in this town before I mention Great Lakes. Located near the West Side Market in Ohio City, it is an ideal location to stop after a long day of shopping or to eat before a downtown event. Their food offerings, many made with the beers they brew and locally sourced ingredients, are delicious as well. 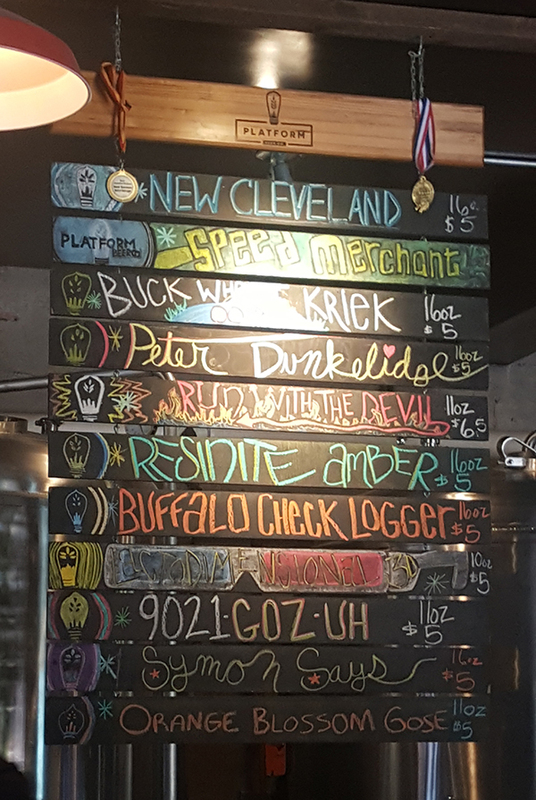 Their core beers, like Dortmunder Gold (which they also use in their mustard) and Edmund Fitzgerald porter are always on tap, as well as some unique seasonal and brewery-only offerings. Lake Erie Monster is an amazing imperial IPA for summer, and their Oktoberfest in the fall is top notch. You can book a tour of the brewery and learn a little bit about some of Cleveland’s haunted history as you do. 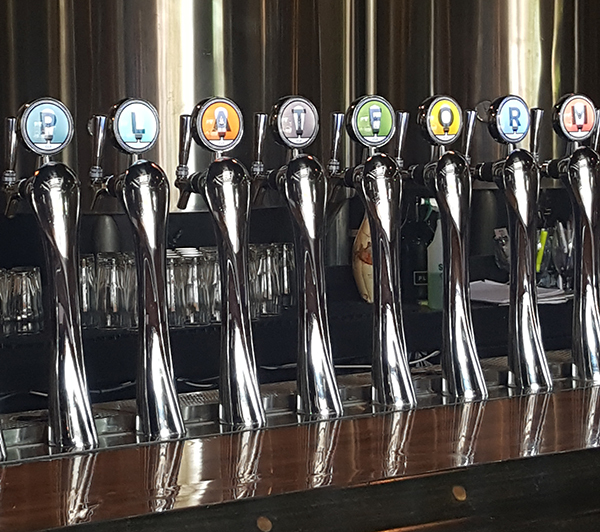 Platform Beer Company (4125 Lorain Ave, Cleveland, OH 44113, 216-202-1386) – There are two amazing things happening at the Platform Beer Company. The first is offering excellent beers in a casual, industrial setting. The exposed brick walls mesh well with the polished steel vats and unique beer handles. They offer their wide range of beers, from rich, smoky stouts like Anathema #1 to fresh, sour goses like 9021 Goz-uh, brewed with watermelon, as pints or in flights for you to sample. The second thing the company’s commitment to helping other local brewers start their own brewery. Not just how to brew beer, but how to run the business end of it as well. If you get hungry here, they have different vendors coming in daily for a variety of eats. Or you can hit the Plum Café and Kitchen next door and bring it to the brewery with you. Butcher and the Brewer (2043 E 4th St, Cleveland, OH 44115, 216-331-0805) – The farm-to-table movement is alive and well on the north coast of Ohio. This outstanding space offers as much locally sourced ingredients as they can buy, and that goes for their beers as well. They are all solid brews, from the summery Repeater kölsch to the rich and creamy Midnight Oil milk stout. You can taste the freshness in the food, and since it is seasonally purchased the menu changes frequently. Community is not just something they support with their dollars; their long tables encourage you to make friends as you dine and drink. Press Wine Bar (2221 Professor Avenue, Cleveland, 44113, 216-566-9463) – One of the first places on this list where “open, light and airy” would be the best way to describe the atmosphere. Press offers an extensive beer and cocktail menu in addition to their global wine list. Their selection includes exotic bottles like the 2011 Numanthia "Termes" Tempranillo from Spain to locally produced Riesling from South River Vineyard in Ohio. In addition to the well-balanced bar offerings, they have a food menu that ranges from small bites to full meals. The décor is just as impressive as the food and drink, highlighting the openness of the space. Humble Wine Bar (15400 Detroit Ave, Lakewood, OH 44107, 216-767-5977) – It is hard to determine which is more impressive, their wine list or the pizza they serve. If you do not feel like one of their delightful pizzas to go with your wine, you can select from their small plate and charcuterie menu. Their list offers a vast selection of wines for the meal you select, whether you have a glass of the 2013 Foxglove Zinfandel to go with the Quatro Formaggio pizza or bottle of 2015 Terlato Pinot Grigio with a White Wine Cheese Plate. Add a patio into the mix and you have a great way to finish a day. Griffin Cider House (12401 Madison Ave, Lakewood, OH 44107, 216-767-5444) – What does a British citizen living in the United States do when the only ciders he can find are light ones? He starts his own cider house. Owner Richard Read creates his own full-bodied, English style ciders from local apples. There is a wide range of styles and flavors to choose from, from the incredibly popular unfiltered Burley Man to the summery Lemon Blues. On top of the ciders, they have one of the largest gin collections from Chicago to New York. The fifty different bottles they offer range from the local small batch gin made by Seven Brother’s Distillery, crowd favorites like Boodle’s, and high end players like Nolet’s Reserve. If you are not sure what to try first, gin and cider flights are available. Portside Distillery (983 Front Ave, Cleveland, OH 44113, 216-586-6633) – Which comes first, the liquor or the beer? If you want to get into the technicalities of it, distiller’s beer comes first when making liquor, but Portside Distillery was envisioned as a distillery and brewery from the start. They have been producing locally sourced rums since 2012 and kicked off their beer production with their fan favorite 216 Pale Ale in 2015. Start your rum tasting journey with their traditionally distilled Silver rum, then wander a spectrum of flavors that include sweet Vanilla Maple to their unique Hopped rum. TownHall Urban Café (1909 W 25th St, Cleveland, OH 44113, 216-344-9400) – This joint is jumping. Premium beers, craft cocktails, and a wide ranging food menu is just the start of why you should stop here. They offer a little something for any dietary need, whether you are vegan, looking for something gluten free, or just trying to eat a little healthier. Their attention to a range of diets on the menu extends to “Sophisticated Swill” with cocktails that include Carmine, a paleo-inspired libation featuring mint-infused Avión and kiwi-strawberry-jalapeño puree. For something more traditional, I point you to the Sandyfornication, a shrub-like sweet and fruity cocktail with a vodka base. They are located in the heart of Ohio City, with easy access to a number of other bars and other curiosities. You can celebrate your healthy meal and cocktails with a visit to Mitchell’s Ice Cream right next door. You get a reward, right? While I know this is a long list of places to go in Cleveland, this leaves out some favorites like The Side Quest (games and cocktails), The Spotted Owl (classy, delicious history), and many others. The culture around spirits in the city rivals what is happening in any other major city. Innovation, grit, and pride in the bounty of northeast Ohio are part of everything that is produced up there. Next time you are in Cleveland, take a little extra time to dig into the variety of experiences the bars here have to offer. Just don’t order any flaming cocktails. A big thank you to USBG Cleveland, especially Danina Calame of the Velvet Tango Room, and USBG Columbus for all of the help with this article. Cleveland has a diverse cocktail scene, and their suggestions helped narrow down my research. Cheers!